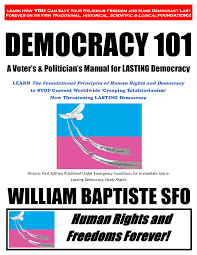 LEARN The Foundational Principles of Human Rights and Democracy to STOP Current Worldwide ‘Creeping Totalitarianism’ Now Threatening LASTING Democracy! YOU are in the flow of living history! The future of Human Rights and Democracy worldwide is being set RIGHT NOW, and YOU can help make sure they stop eroding away! LEARN DEMOCRACY 101 and Join a Worldwide Movement of EDUCATED Citizens Standing Up in SOLIDARITY to Ensure Human Rights and Democracy Last Forever on Their Firm TRADITIONAL, HISTORICAL, SCIENTIFIC and LOGICAL FOUNDATIONS! Learn How YOU Can Save Your Religious Freedom and Make Democracy Last Forever! Millions in Western nations who still hold the traditional Western values all our Human Rights and democratic freedoms were historically and logically built on (and need to last) have been made extremely uncomfortable by massive social and legal changes to Western societies over the last decades, which are now happening with increasing frequency and with increasingly anti-democratic and “totalitarian” character (the “total-control, belief-control” character typical of oppressive totalitarian States which do not understand that Democracy is government “of the people, by the people, for the people”). This effect is worse in some places than others, but ‘Creeping Totalitarianism’ is a worldwide trend gradually but increasingly undermining Human Rights and Democracy from their very foundations. In many jurisdictions for some time it has effectively become the case that citizens are only "free" to hold traditional Western values privately, in a home or church or synagogue, as long as those Traditional Western Values no longer influence public policy. But since, as demonstrated from undisputed historical (and scientific) facts and sound logic in DEMOCRACY 101, all Human Rights and democratic freedoms depend ultimately on the tried and true Western values they were built on, this means public policy is gradually becoming increasingly totalitarian in character. So now, as the anti-traditional, anti-democratic momentum of decades increases, in more and more places and professions people (even elected representatives) are being BULLIED INTO SILENCE about their traditional (democracy-grounding) values. In one region more advanced in ‘Creeping Totalitarianism’ (WARNING US WHERE THE REST OF THE WEST IS HEADING), the government just passed a new law that once strictly implemented will mean parents will no longer even be "free" to practice and teach traditional values AT HOME without LIVING IN FEAR about being REPORTED for TRADITIONAL childrearing in their democracy’s FOUNDING VALUES which the radically anti-traditional (and ‘Creeping Totalitarian’) government no longer considers "in the best interests of the child" but rather as grounds to take children away from their parents! ALL THIS MADNESS is based on politicians and the voters who vote for them both being too UNEDUCATED in the history and logic underlying Human Rights and Democracy itself to know how to make Democracy last, and this sound HUMAN RIGHTS EDUCATION in a “crash course” called DEMOCRACY 101 is offered as the cure. •Any democracy that wants to REMAIN a democracy must keep its politicians accountable to democratic foundations and teach these to its citizens. OUR WESTERN DEMOCRACIES HAVE UTTERLY FAILED ON BOTH COUNTS. •DEMOCRACY 101 details historically proven STRATEGIES for getting democratic governments compromised by totalitarian thinking to get back to their foundations. Before his Ph.D. studies at the Sheptytsky Institute and being a professor at Dominican University College (where he replaced Dr. Andrew Bennett, appointed Canada’s Ambassador of Religious Freedom), William Baptiste got his Master’s Degree with Honors at Franciscan University of Steubenville (FUS), where the Philosophy Chair testified in writing to the University President of “his tremendous academic talent” and “considerable power of mind;” a genius IQ which he has since used to discern and lay out clearly from the tangled webs of historical details the “golden threads” woven throughout history that give us all our Human Rights and democratic freedoms. At FUS, the famous Dr. Scott Hahn wrote William’s work was “outstanding,” “excellent,” “clear, thoughtful and thorough,” and the Theology Chair Dr. Alan Schreck endorsed William’s educational Donum Veritatis - The Gift of Truth Ministries “as an effective and important means to spread the faith and to promote Christian unity… It really is a ‘gift’ to the ‘Internet Generation.’” He was invited three times to the ecumenical Springtime of Faith Rome Summits (Catholic and Evangelical Christian leaders meeting with Vatican Officials) for being considered “one of the dynamic leaders building the New Springtime of Faith.” He recently founded Human Rights and Freedoms Forever! in response to accelerating attacks on human life and freedom throughout the West since 2015. Having taught a course in the Formal Science of Logic, he reminds all those who would read his above Christian qualifications and be tempted to simply dismiss his book DEMOCRACY 101 merely on that basis (instead of engaging with its powerful facts and logic with intellectual honesty), that to do so is to commit what the Science of Logic calls the "genetic fallacy" combined with circular reasoning, known as "Bulverism." He suggests "No intellectually honest person can deny Western Human Rights and freedoms start with The Foundational Principles of Human Rights and Democracy identified herein, which Christianity introduced into the West, and only the intellectually dishonest would dismiss this book lightly and without engaging with its undisputed scientific and historical facts and sound logic. But LASTING Democracy, religious freedom, and Human Rights for all requires that in response to current ‘Creeping Totalitarianism’ this book starts a DIALOGUE in Western nations about just how to ensure these highest of Western values last for the long-term.